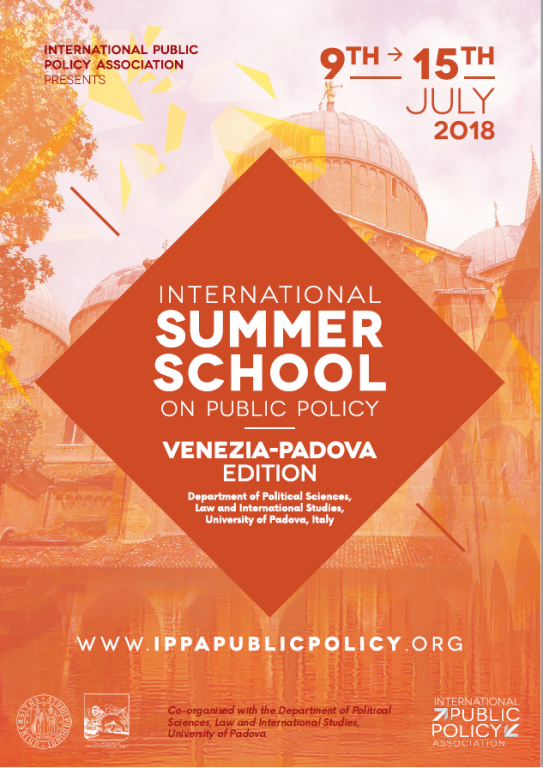 University of Padova and IPPA are proud to introduce "International Summer School on Public Policy -Venezia-Padova 2018". The Summer School will be held in Venezia-Padova, Italy from 9th -15th July 2018 with an aim to promote the diffusion of theories and methods of policy change in the belief that they can improve policy effectiveness in meeting social demands. How can institutional variables be studied in the context of policy processes? How do institutional variables work in policy-making processes? What relevance do institutional mechanisms have in policy change? Participation in policy formulation: instruments for better learning. Five student workshops (3h) and discussion sessions with tutors on participating student research efforts (including but not limited to dissertation proposals, draft dissertation chapters, and manuscripts being prepared for journal submission) with a scholar and fellow students serving as discussants. This event is sponsored by the Standing Group of the Italian Political Science Association.